Let gravity do its work! The term 'Japanese' is a bit catch-all but in this instance it is evident in the scoop shape of the seat itself and the generally very simple unadorned style with the plain leg boards. 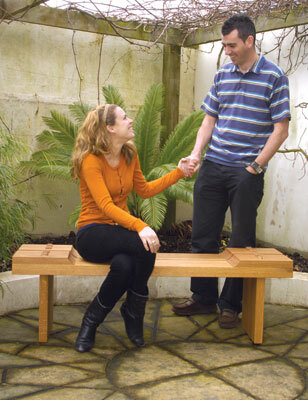 This is an outdoor bench built up from a number of boards so the seat and each leg board - for want of a better word - are biscuited together with Titebond III waterproof glue. Cut the American white oak planks overlength, then plane and thickness them all; in the case of the legs this means to final thickness. 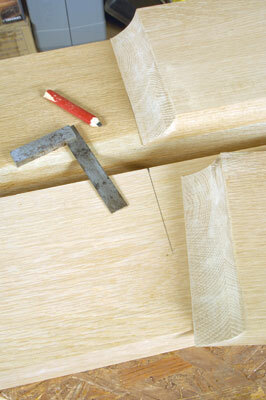 Calculate the thickness of the boards for the seat so they build up to finished thickness. 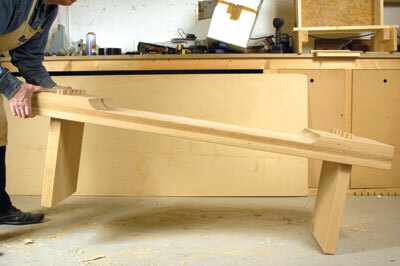 The edges are planed accurately so the finished seat sections can be run through the thicknesser on edge after glue-up. Biscuit the leg boards together, taking care not to allow the beech biscuits to be exposed. This is because beech is more vulnerable to weathering and rot than oak. Now saw the boards fractionally over final width and do one or two passes over the planer table to clean up the sawn edges. 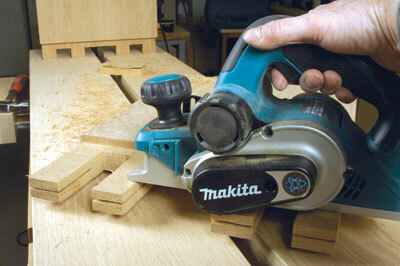 Use a tablesaw or a compound mitre saw to cut the boards ends square to length so the tenons protrude through the seat top by 20mm, to be trimmed to 15mm after assembly. Belt sand the leg boards, then random- orbit sand to a smooth finish; the final abrasive grade is not critical as this furniture is subject to weathering. Use a small router and bearing-guided bevel cutter to lightly bevel the edges; make a larger bevel cut on the bottom of the leg boards. 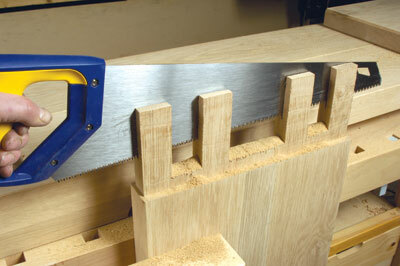 The seat, comprising two sections side by side with a gap between, is built up to thickness from four boards, the top pieces being short so they can be cut economically from one board length for each seat section if the saw is canted at 45 degrees for the cut at the inner end of each piece. 1 Biscuit and glue the two full-length boards together, cramp up and leave to set. Take the short upper sections and glue them together. Once dry, mark the curve or scoop shape. Do this on the four pieces and cut the curves on a bandsaw using a narrow blade in order to follow the rather tight radius. If you don't have a suitably narrow blade then a series of relieving cuts followed by short straight cuts, finishing off with in-out nibbling cuts will be necessary. 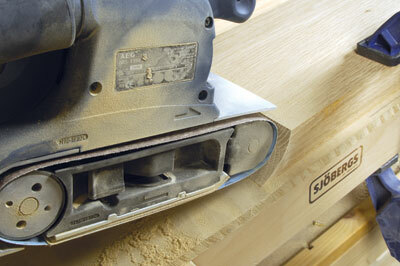 3 Cleaning up with a belt sander is necessary to achieve a truly smooth and even curve. 4-5 Place each short seat section in turn on the saw and trim the feathered end of the curve very slightly so it is neat, giving a slight step when glued in place. 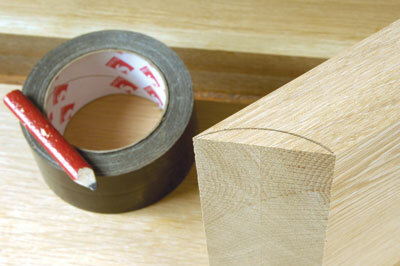 6-7 Glue these pieces onto the seat sections, cramp carefully so the sides align neatly, and leave to set. Clean any protruding lumps of glue off the seat sides and carefully run through the thicknesser, just skimming off a millimetre or so to leave the sides smooth and square. The whole of each seat section can be belt sanded. 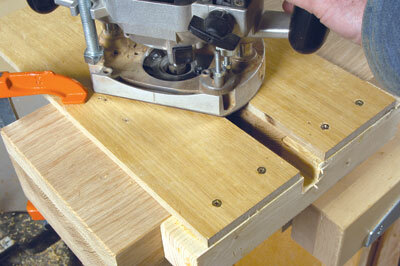 8 Use a small router and a bearing-guided bevel cutter to lightly bevel all edges for comfort and appearance. 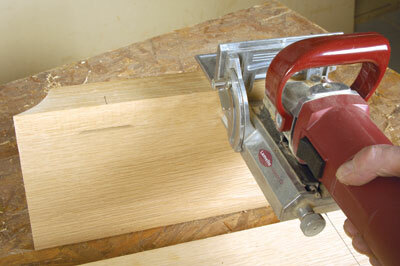 Take off sharp corners with a block plane. The mortise holes are the next challenge. 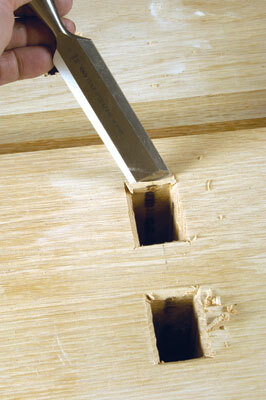 Mark out the mortise positions, bearing in mind that the tenons are joined by a haunch in between them. Thus you need a 25mm wide x 20mm-deep slot running across the underside of each seat section but stopping where each outer mortise is. 9-12 Having made all the mortises, the openings on their undersides will benefit from slight chamfering to ease the tenons in. On the top side it is now necessary to mark outer crosswise lines because the sockets need to be opened out with a wide chisel to create 'dovetail' openings. 13 Returning to the leg boards, use a large router and a T- square to establish the tenon shoulder line and depth, then move the router as far away from the shoulder cut without it slipping off into the cut area, so the base remains supported. 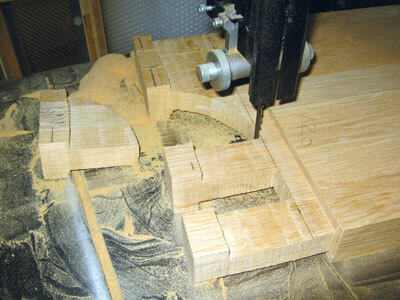 Machine away unwanted wood freehand but leave the waste at the end of the tenon so it is machined to thickness from both faces with only the end face waste remaining. 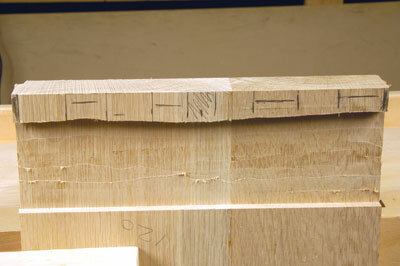 14-16 Mark the tenons and haunch positions from one face and saw out on the bandsaw, then remove the face waste at the end of each tenon using a handsaw. 17-18 Kerf the tenons across-wise and downwards for most of the tenon length ready for wedging, then invert the seat sections and try a joint fit, making the necessary adjustments with a fine-tooth saw and sharp chisel. 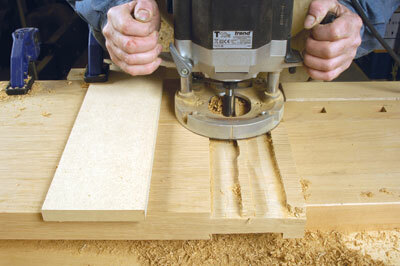 If necessary use a planer on a fine setting to slim the tenons. Once the tenons can be persuaded at least a third of the way in without much force, they should be about right. It is probably best to adopt my assembly method as some force is required. 19 Turn the bench the right way up then lift one end and drop it so the tenons are forced in. Do the same thing at the other end and repeat until the heavy seat sections have bedded down onto the tenon shoulders, allowing gravity to force the assembly together. 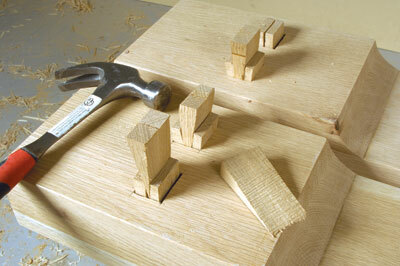 20 Cut large, wide wedges and hammer them into the tenon kerfs until they won't move down any more. 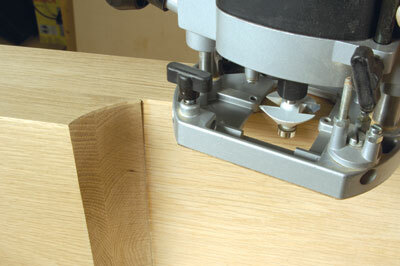 Once all are in place and the mortise openings are tightly packed by the wedged tenons, trim off the exposed tenons using a fine-tooth saw resting on two 15mm MDF offcuts. 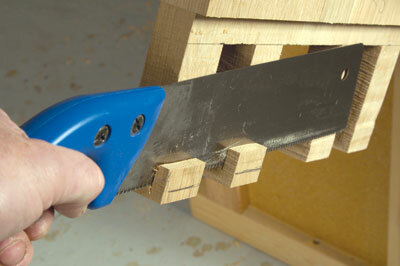 Chisel a bevel on all four tenon edges to give a finished appearance. The choice of finish is up to you but the oak will eventually weather even with an exterior-grade coating. "The seat top pieces are short so they can be cut economically from one board length"
There are several options for cutting the mortises. Method 1: use a large auger-type bit and a powerful drill to remove the bulk of the waste; hold the drill exactly perpendicular to the workpiece to avoid going off line. 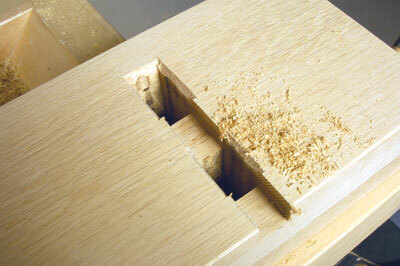 A very sharp chisel and mallet are then required to square out the holes. 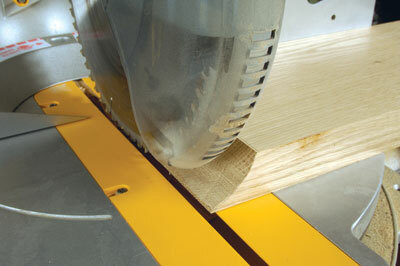 Method 2: a router and an extra long 12.7mm or larger-diameter straight cutter. You will need two fences and long adjustable fence rods or a home-made jig that allows the use of a guidebush. 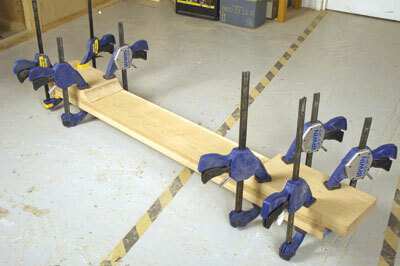 By turning the jig around it is possible to do both sets of mortises. Since router cutters are limited in length, you will have to accurately transfer the markings so you can machine from both faces. Finally you will need to square the holes with a chisel although there will be less to do than with the auger method as the jig allows the cutter close to the corners of each mortise. 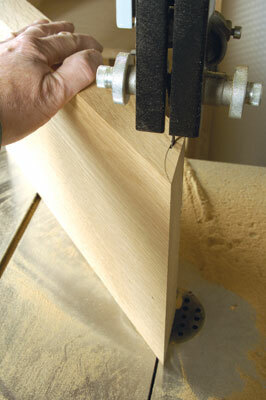 The third method, adopted here, is to use a chisel mortiser if you are lucky enough to have access to one. Surprisingly this is quite hard work as the chisel bit has to cut deep into hard oak and burns easily. 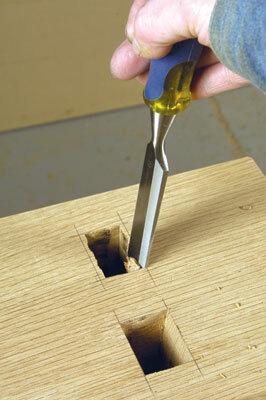 This isn’t quite the easy option it might appear; however it does result in square-cut holes. Allow most of a day for this exercise as there is a lot to do.